So since we are still in the multiple-watches-as-an-accessory mood from my PF post 2 days ago…how about we continue with the theme. 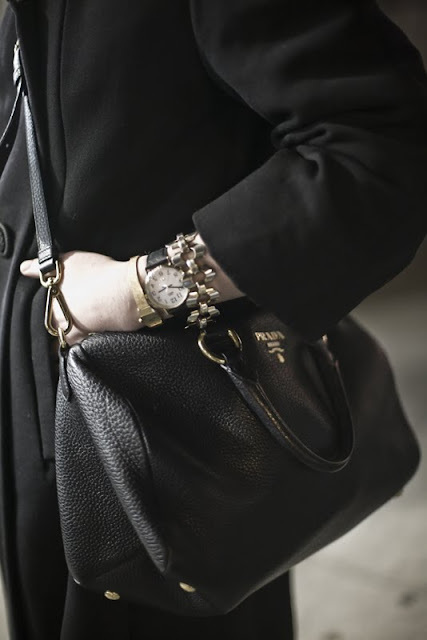 Check out Caroline Grosso’s cool multiple wrist watches and bracelet as an accessory. In the age of facebook and twitter I think 2 watches is the least anyone would need to keep track of their world wide web connections, right? And after the function of keeping you updated on what time your friend Tom in Thiland will wake up is served by the second watch, It does add a little extra especial interest to the look too. As a fashion assistant at Vanity Fair Magazine, Caroline ofcourse had amazing taste. I like the clean lines of her entire outfit. The coat, the skinny jeans, the shoes and even her purse, were all clean lines. Sometimes classics are all you need to make a well-composed outfit. After we were done shooting her, we spent almost 15 more mins with her just chatting away. I asked her where she was from originally and she responded, "This very exotic place called New Jersey"...lol...She now lives in my neighborhood in Manhattan. From Vanity Fair to Jersey Shore, we stood outside is the blistering cold, just being girls yapping away about stupid things. Was so much fun!! loved all the pieces! very good shots as well. My fave is the third image. 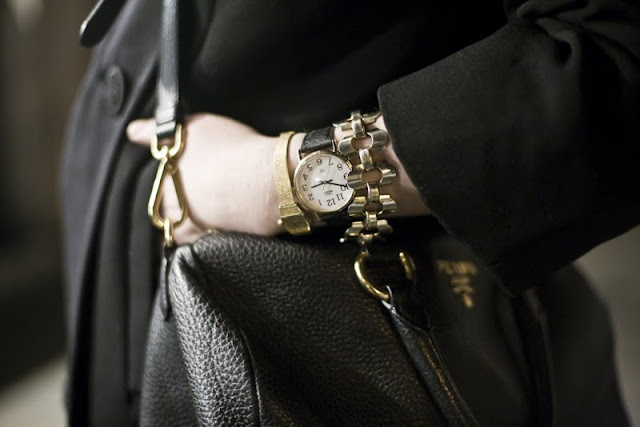 I love the watch/bracelets combo, and the way it looks against the hardware of the bag. You're a great photographer! Really nice pics.. i like the simplicity of the pics as well.. simple classiness about this one! Nothing like a good black-in-black mix!